José Raúl Capablanca was world champion from 1921 to 1927. Many people considered him the strongest player in the world prior to 1921, but he was unable to arrange a match with the then-champion, Emanuel Lasker. When public sentiment became overwhelming in demand of a match, Lasker simply tried to resign his title to Capablanca. This behavior seems to add credence to the view that Capablanca was the better player years before the match finally took place. In fact, beginning in 1914, Capablanca lost only a single game over the next eight years. Capablanca’s dominance was so great that he was nicknamed “the chess machine.” Even great players felt that he was unbeatable. Capablanca eventually became somewhat bored with chess because it was too easy. For him, it may have been. 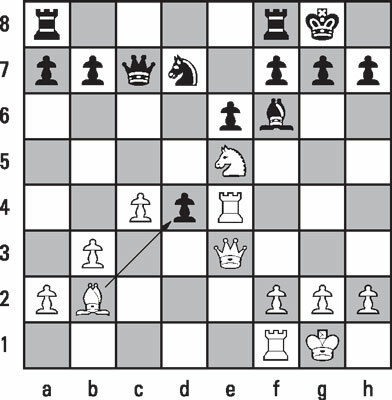 In the game Capablanca-Benito Villegas from Buenos Aires in 1914, black has just played the move 17… cxd4 to arrive at the position shown here. Capablanca avoids the “natural” move. 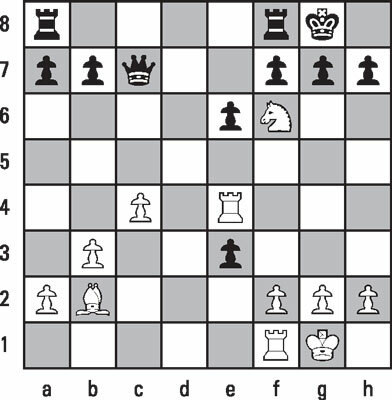 If Villegas had played 18… dxe3, capturing white’s queen, Capablanca would have continued with 19. Nxf6+ — see the following figure. Black has a Morton’s fork choice of either 19… gxf6 or 19… Kh8. White would have delivered checkmate after 19… gxf6 20. Rg4+ Kh8 21. Bxf6#, but 19… Kh8 would also have lost to 20. Rh4, with the threat of 21. Rh7#. If black had avoided this threat by playing 20… h6, white would have gained the upper hand by playing 21. Rxh6+ gxh6 22. Nd5+, winning black’s queen. The truly great players could all see obvious moves, but they knew to look beyond them.